The City of Fremantle’s six-monthly green waste verge collection kicks off again next week. All domestic properties north of South Street (Area A) will have their green waste collected from Monday 17 September, while green waste from all domestic properties south of South Street (Area B) will be collected the following week, from Monday 24 September. City of Fremantle Facilities and Environment manager Tony Strickland said all of the green waste collected will be recycled into mulch. “We’ll collect tree trunks, branches and shrub prunings up to 1.5m in length and 30cm in diameter, or two standard trailer loads of green waste,” Mr Strickland said. “Because it all gets recycled into mulch we can’t accept leaves or grass clippings in boxes or bags, and we also ask people not to leave out general rubbish, weeds or sand or soil. To make it easier to collect, green waste should be placed away from walls, fences, power poles and trees and should not obstruct footpaths, driveways or sprinklers. The next green waste collection will happen in April and May next year. If people miss the verge collection they can drop off green waste at the City of Fremantle Recycling Centre on Montreal Street free of charge all year round. For more information visit the Green Waste page on the City’s website. Those in North Fremantle who claim Freo Council does not look after them can be silent now. 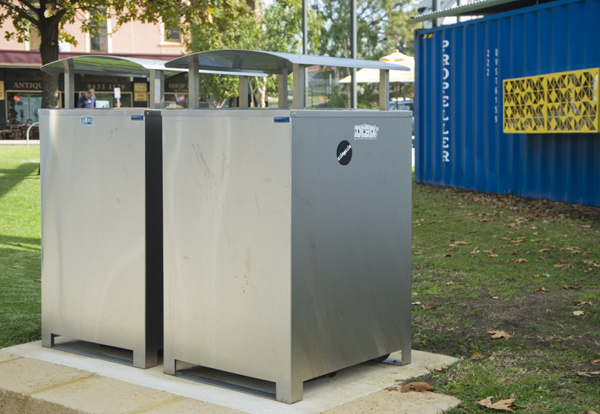 These massive rubbish bins I photographed near the Propeller Cafe this morning are hopefully the start of a Fremantle wide roll out in the more frequented and tourist areas of the city where ugly plastic wheelie bins are still creating visual pollution. Not sure why one of these bins was not made a recycling bin and disappointing the COF still needs to use plastic bin liners because it is probably the most practical way. “International zero waste experts, Professor Emeritus, Paul Connett, St Lawrence University, Canton New York and Professor Steffen Lehman, Head of Architecture and the School of the Built Environment at Curtin University, a zero waste and planning expert, will together with Mr lee Bell, heavy metals expert to the International Persistent Organic Pollutants (POPs) Elimination Network (IPEN) and National Toxics Network (NTN) will be participating in a panel discussion, taking questions from the public about the four incinerators recently approved by the WA EPA and alternative solutions. This is an incredible opportunity to hear from some of the worlds leading experts on the dangers of incineration and the pathways towards sustainable zero waste solutions for Western Australia. The south metro region has been targeted for two massive incinerators making this an environmental health and justice issue for all south metro regional councils, their constituents and the environment. As such all WA local governments are under pressure from regional councils to commit to long term waste management contracts to secure the vast waste streams needed to fuel the waste to energy incinerators planned for WA. With four incinerators approved in WA now, this pressure is set to increase. To understand how this dirty energy industry is being promoted, this article may be of interest to you.